In 5-quart stockpot or Dutch oven, place potatoes and water. Cover and heat to boiling; reduce heat to medium-low. Simmer covered 9 to 11 minutes or until potatoes are tender when pierced with paring knife. Drain potatoes; cool about 10 minutes or until cool enough to handle. Meanwhile, in large bowl, beat oil, vinegar, mustard, garlic, salt and pepper with whisk until combined. Stir in onions, parsley and thyme. Cut potatoes in quarters, and add to vinaigrette in bowl; toss to coat. Spread arugula on large platter. 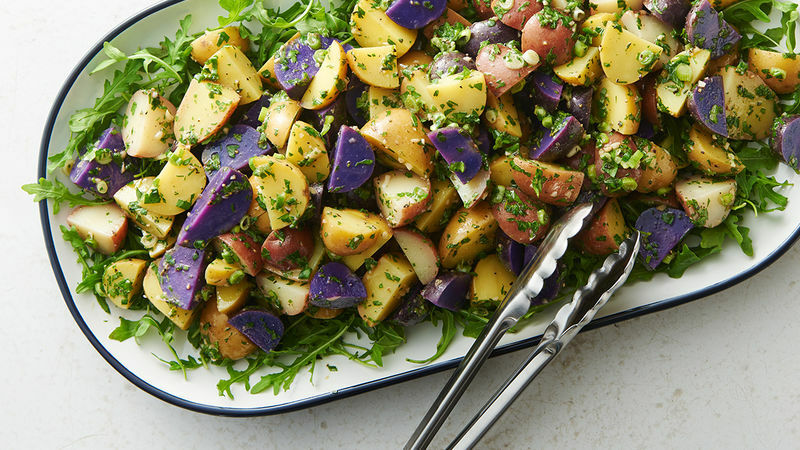 Spoon potato mixture over arugula. Serve warm. Small tricolor potatoes usually come in 1 1/2-lb bags. Want more purple? Look for baby purple potatoes in the same-sized bags at gourmet grocers. Be gentle cutting the potatoes to avoid mashing them.